Boars are the larger cousins of the pig. They are males that can usually be found scurrying about the underbrush of forests or rooting through trash near civilization. Boars are herbivores and are not known to attack those that do not threaten them. They have two tusks that protrude from both sides of their mouth which they can use to great effect. It is not unheard of for a man to be eviscerated by a charging boar. 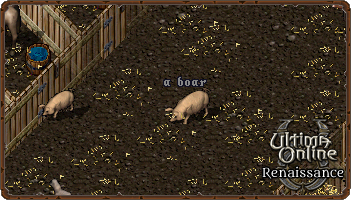 The meat from the boar is best when taken from around the belly. Racks of ribs are harvested from boars in a similar fashion to that of pigs. Some woodsmen have returned from the forests telling stories of a golden-colored wild boar. The Moonglow zookeeper has offered a reward to anyone that can bring this specimen to him so that he may exhibit it in his zoo.